Well, Jay Lauf, co-president and publisher of Quartz, made this happen with his team. He told the story of how they did it in his Content Marketing World talk, Deconstructing Quartz (QZ.com): How One of the Most Popular Mobile Destinations Grows Audience, Extends Reach in Digital, and Creates a Superior Content Experience. If your brand is trying to build an audience for your content, you can learn from the Quartz team’s experience. Think of your content team as a media company within your company. A news company owned by Atlantic Media, Quartz launched in September 2012 with the website qz.com. The founding team members came from news organizations, including Bloomberg, The Wall Street Journal, The Economist, and The New York Times. These folks create content people want. The company continually grows its content team – 150 journalists on five continents. The content is all digital. The content is designed first for tablets and phones. 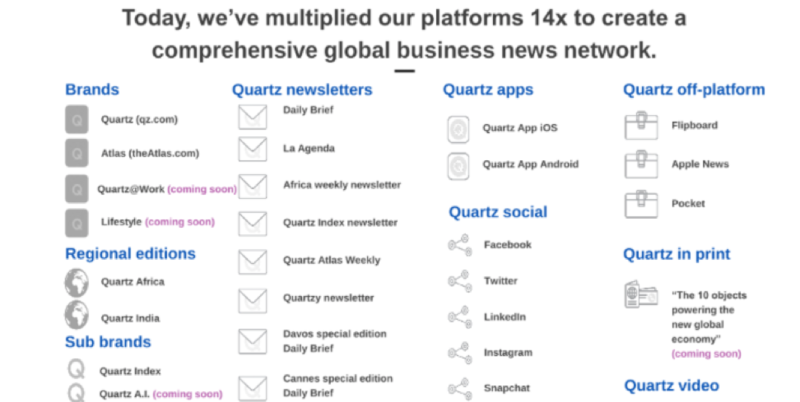 After establishing a following on its website, Quartz added ways to distribute its stories: an email newsletter, an app, and social media (Facebook, Twitter, LinkedIn, YouTube). 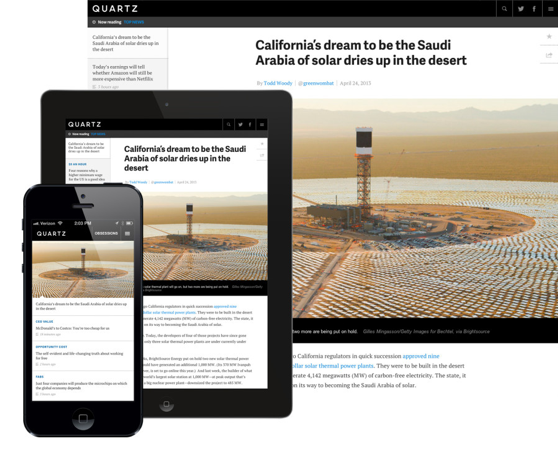 The content lends itself to aggregation by news platforms, such as Apple News, Flipboard, and Google Newsstand thanks to the versatility and insight of the reporting as well as the design of Quartz’s products. The content includes several video series. 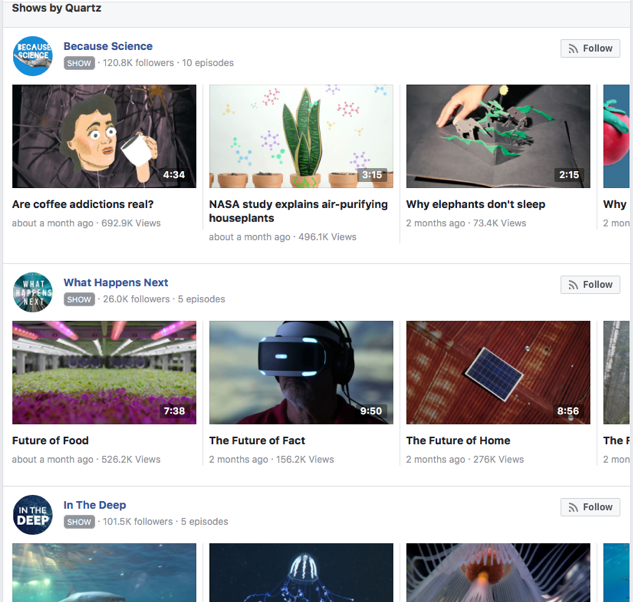 While it’s impossible to pinpoint the number of people who regularly consume Quartz news via all these channels, Jay estimates the company accrued 100 million regular viewers in its first four and a half years. To what does Jay attribute this kind of success? What did Quartz do that the rest of us might want to copy? 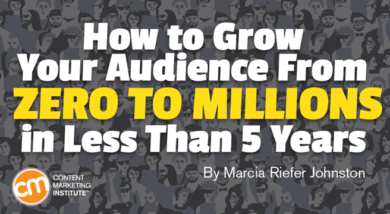 How many exclamation-point-packed tweets does your content get? There’s so much to say about the quality of Quartz content that I’m working on another post on that topic alone – stay tuned! Find your sweet spots for content length. Use third-party platforms to your advantage (but don’t depend on them). Make big decisions with your gut, small decisions with data. Since Quartz researchers found that executives throughout the world (its audience) consume news more on phones than on desktops, Quartz designs for mobile devices first and desktop second. “These are deeply intimate devices on which people are now consuming content, so there’s a great opportunity to engage them,” Jay says. Because Quartz launched in “the age of acceleration,” Jay says, quoting Thomas Friedman, it owes some of its success to being “unshackled” from a lot of the considerations traditional publishers have had. “A lot of publishers have to wrestle with how to port their print content into a digital environment, never mind trying to figure out how to take the desktop expression of what you’ve done and fit that into a mobile environment. We had the luxury of starting from scratch,” Jay says. He goes on to say that mobile is “scary to a lot of people because (they) don’t know how to port what we’ve been doing on other platforms into this smaller, more intimate screen.” Still, he says, the opportunity – if we embrace it and think deeply with the human element – is tremendous. For Quartz readers, content needs to be either long or short – a classic smile curve. On the y-axis is traffic or impact, such as the number of people who have read a piece, tweeted it, or otherwise indicated that they found it engaging. On the x-axis is the length of the piece. Quartz publishes content on either side of that curve – “not in that middle trough” like the 500- to 800-word articles that news operations have cranked out as the common unit of production for over a century and that often die on the social web. Quartz goes left or right on the curve. “That’s where the content sings,” Jay says. When’s the last time your company insisted that a writer spend another couple of months on a piece of content? Of course, your audiences’ sweet spots for content length may not line up with the sweet spots for Quartz readers. Sow your research and see what you discover. Quartz has learned to go where its audience is. Zach Seward, one of the co-founders of Quartz, early on thought about Quartz as an API (application programming interface). “Quartz can go anywhere our readers are, in whatever form is appropriate,” he says. For example, in 2016 Quartz published a series of videos to Facebook, doubling the number of Facebook followers and driving people to qz.com. “Quartz” has become an adjective or a verb. People have said to Jay, “OK, I want to Quartzify this” or “That’s very Quartzy.” The Quartz tone, design approach, subject matter, and story angles are that distinctive. Intuition also inspired the company to launch the app last year that does something that other news apps weren’t doing: It makes news stories literally engaging. You must interact with the interface to get from one story to the next. 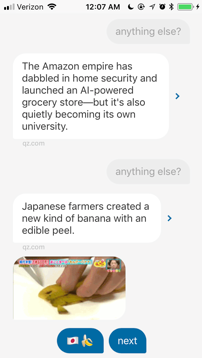 The stories float up from the bottom of the screen in chat-style bubbles sprinkled with gifs, emojis, and quizzes. Which blue button would you click here: Next? Or the banana button? Seriously. A banana button. In a news app. News = grimness. Bananas = things people slip on in cartoons. Use third-party platforms to your advantage. Has your team done some of these things? What has worked for you? Learn firsthand how companies are successfully growing their audiences at Content Marketing World Sept. 4-7 in Cleveland. Register today and use code BLOG100 to save $100.